"The Prince and the Pauper"
90 Delegates Disqualified for Baath Membership?" I do not usually use the wildly erratic Israeli site "DEBKAfile" as a source but this report, if true, would be such bad, bad news that I thought I should post it. Yes, there was an election. Yes, there will be a government. Will that government's existence gradually woo Sunni Arabs from support of the insurgents? Not if this kind of thiing is characteristc. "The decision by the Iraqi Supreme Court to disqualify 90 delegates who were elected to parliament on December 15, most of them Sunni Muslims, because they were once members of the Baath Party, echoes the decision reached in the middle of 2003 by Paul Bremer, the first US administrator for Iraq. At that time, Bremer, who was new to the job, ruled that all members of Saddam Hussein’s Baath Party and officers and sergeants of his armed forces - especially if they were also members of the Baath Party (had they not been, they would not have been considered for promotions) - would not be eligible for posts in the new regime or the new army to be established. Bremer’s ruling was considered the second worst mistake the Bush administration made in Iraq, next to defense secretary Donald Rumsfeld’s decision – contrary to the view of most US military experts – that 150,000 troops would be sufficient to dismantle Saddam’s regime and bring Iraq under control. This ruling condemned many thousands of former Iraqi officers and soldiers to choosing between a life of poverty and deprivation for themselves and their families and their only alternative: to join the Sunni Muslim guerilla war - with the guarantee of a monthly paycheck equal to their wages from Saddam’s regime. Most of them chose the latter, giving the leaders of the guerilla war against the Americans an infusion of professional and experienced manpower. " "And Did You See the Dress She Was Wearing?" All you news junkies out there!! Count up on your fingers and toes the number of times this week you have heard anchors and "guests' from the media mention the "White House Christmas Party for Journalists." Off-hand comments about what the president joked about, what Laura was wearing, who was there, little knowing smiles and insider smugness, that's what we have been treated to this last week. Corporate media people and the "newsies" themselves evidently would throw themselves under the wheels of a Metro bus if they did not get an invitation. After all, how else would anyone in Washington, New York or Atlanta know they were important? Is that what happened to Hemmer and poor Aaron Brown? No invitation? Clearly, the money spent on that (or those) party(ies) is one of the best investments that any White House could ever make. It will be interesting to see what happens to Abramov. We should not feel too much personal animus toward him. He should be seen as merely a symbol of the continuing evolution of the journalistic/financial/lobbying/congressional/executive branch complex. "Khaddam was an important adviser to Hafez Assad and later to Bashar Assad before he resigned at the Baath Party congress in June. He visited Hariri's grieving family the day after the slaying, calling the assassination an "earthquake" that would reshape Syrian and Lebanese politics. Subtext - "Consigliere abandons son of "The Boss," seeks his own way in the world." There really is no honor among thieves, despots, and despot wannabes. Abd al-Halim Khaddam was a favored henchman for Hafez al-Assad for many years, serving in a variety of ministerial posts and ending as a vice president. He is from the Sunni faction of the Syrian Baath Party. He has always resented the new Assad. It was hoped by those on the Sunni side of the Syrian Baath that it would be possible to ease the young man out of the succession, but that failed in face of opposition from the largely Alawi leadership of the army and security services. This was a great disappointment in Sunni Arab circles across the Middle East and especially among the moneyed oil people. Bashar has proven unable to master his difficulties, unable to reform the political, economic and international challenges facing the country, and so he is vulnerable. Oil country money and influence backs the idea of removing him. The United States has followed the "leader" in this matter. Rafik Hariri? He has become an interesting symbol of the possibility of reforms which he never really favored. He, too, was a more or less faithful ally and subordinate of Hafez al-Assad for many years. Now the Sunni, US and French pressure applied to Syria is beginning to look serious. "Regime Change" as a policy now seems to be an open prospect. Up until now, no serious candidate has been located to take the doctor's place. This man is a little long in the tooth, but might serve. "As a fuel crisis deepened in Iraq, the government replaced its oil minister with controversial Deputy Prime Minister Ahmed Chalabi, whose poor performance in the Dec. 15 elections was a setback in his recent attempt at political rehabilitation. Rising like a phoenix from the ashes of his electoral debacle, "The Ahmad" as he is affectionately known in the Pentagon and the Old Executive Office Building (NSC staff) marches on like a beacon of looming economic difficulties, bearing a torch for someone or other. This appointment is supposed to be temporary. We will see. Bankers across the world are licking their chops in anticipation..
"Old Wine in New Bottles"
KIRKUK, Iraq - Kurdish leaders have inserted more than 10,000 of their militia members into Iraqi army divisions in northern Iraq to lay the groundwork to swarm south, seize the oil-rich city of Kirkuk and possibly half of Mosul, Iraq's third-largest city, and secure the borders of an independent Kurdistan. Five days of interviews with Kurdish leaders and troops in the region suggest that U.S. plans to bring unity to Iraq before withdrawing American troops by training and equipping a national army aren't gaining traction. Instead, some troops that are formally under U.S. and Iraqi national command are preparing to protect territory and ethnic and religious interests in the event of Iraq's fragmentation, which many of them think is inevitable. The soldiers said that while they wore Iraqi army uniforms they still considered themselves members of the Peshmerga - the Kurdish militia - and were awaiting orders from Kurdish leaders to break ranks. Many said they wouldn't hesitate to kill their Iraqi army comrades, especially Arabs, if a fight for an independent Kurdistan erupted. "It doesn't matter if we have to fight the Arabs in our own battalion," said Gabriel Mohammed, a Kurdish soldier in the Iraqi army who was escorting a Knight Ridder reporter through Kirkuk. "Kirkuk will be ours." The Kurds have readied their troops not only because they've long yearned to establish an independent state but also because their leaders expect Iraq to disintegrate, senior leaders in the Peshmerga - literally, "those who face death" - told Knight Ridder. The Kurds are mostly secular Sunni Muslims, and are ethnically distinct from Arabs. Their strategy mirrors that of Shiite Muslim parties in southern Iraq, which have stocked Iraqi army and police units with members of their own militias and have maintained a separate militia presence throughout Iraq's central and southern provinces. The militias now are illegal under Iraqi law but operate openly in many areas. Peshmerga leaders said in interviews that they expected the Shiites to create a semi-autonomous and then independent state in the south as they would do in the north. The Bush administration - and Iraq's neighbors - oppose the nation's fragmentation, fearing that it could lead to regional collapse. To keep Iraq together, U.S. plans to withdraw significant numbers of American troops in 2006 will depend on turning U.S.-trained Kurdish and Shiite militiamen into a national army. The interviews with Kurdish troops, however, suggested that as the American military transfers more bases and areas of control to Iraqi units, it may be handing the nation to militias that are bent more on advancing ethnic and religious interests than on defeating the insurgency and preserving national unity. A U.S. military officer in Baghdad with knowledge of Iraqi army operations said he was frustrated to hear of the Iraqi soldiers' comments but that he had seen no reports suggesting that they would acted improperly in the field. "There's talk and there's acts, and their actions are that they follow the orders of the Iraqi chain of command and they secure their sectors well," said the officer, who refused to be identified because he's not authorized to speak on the subject. American military officials have said they're trying to get a broader mix of sects in the Iraqi units. I confess to loving Willy and Joe. I will put up cartoons from "Up Front" from time to time. Best wishes to all those connected to the 45th Infantry Division (Thunderbirds), The Oklahoma National Guard and their museum. The Bush use of NSA to Bypass the Courts. A friend wrote to ask me a couple of clarifying questions about my earlier posts on the national security NSA intercepts against US Persons here in the States. This was my reply. "NSA is a part of the military establishment and the foreign intelligence community. It does not normally operate in the USA because of the basic law concerning its existence into which congress wrote restrictions against such uses (with loopholes for extreme situations). It normally functions by receiving taskings from military commands and government departments who are listed in a big thick directive authorizing them to task NSA There is no talk of warrants, FISA courts, etc. because foreigners and their activities are not entitled by law to that protection. The federal courts with their police helpers are very limited in their activities in all the ways that you already know. So, when you call in the then Director of NSA, (DIRNSA) Lt. Gen. Haydon, USAF and tell him that he is to accept taskings within the US against US targets (presumably with some foreign connection) and you do not tell him that he is to follow the same laws and rules that the FBI would have to follow in listening in to the communications of US Persons, then he believes himself (correctly I think) to be released from all the restrictions that previously prevented him from doing that. Why? Because he is a military officer, head of a military agency, acting on the authority of the commander in chief in wartime. In other words, as far as DIRNSA was concerned Bush took the responsibility onto himself for doing something of doubtful legality and probity. So far as DIRNSA was concerned he, personally, was "off the hook." What we then have is the American People being treated as targets by their own military in the same way that Soviet or Cuban targets were treated." From a couple of notes I received about the "NSA" piece below it appears that there is some misunderstanding abut my constitutional views. I would have thought that unimportant to anyone but me, but I see there is some concern about it, for which I thank those involved. I describe myself as a libertarian conservative. I think the Constitution of the United States works just fine and that it created a systen of government designed to limit power, not to expand it. The separation of power among the three branches of the federal government and then between the federal government and the states should be seen, I think, as retaining the balance of governmental power in the hands of the states. We should always remember that the Constitution is the "creature" of the states, not the other way around. Lastly, I would agree with Jefferson and Madison in the Kentucky and Virginia Resolutions that creeping expansionism of power on the part of the Federal government should be viewed with suspicion. Lastly, as Mr. Jefferson rightly asserted, the "people" are sovereign, not the president of the United States. He is not a king, not an emperor not anything more really than the person who runs the Executive Branch. War time assertions of greatly expanded presidential power are nothing new. The sainted 16th president of the US; suspended "habeas corpus," imprisoned thousands without trial, tried civilians before "military commissions" later found by the Supreme court to have been unconstitutional (ex parte Milligan), dissolved legislatures to keep them from voting, created a new state without much authority in law, jailed newspaper editors whose writings he disliked, etc. Lincoln believed that he was justified in doing these things because the country faced an "existential" threat. That was the basis of his assumption of unusual and in many cases dubious powers. Much the same claim is maintained now. The Bush Administration claims that its actions are justified because the country faces an "existential" threat. It maintains that the international Jihadi phenomenon threatens the very existence of the United States and on that basis it insists that it has the right to do "whatever it takes" to keep the United States from being destroyed in the coming years. It maintains that a situation of "total war" prevails and that any amount of suspension of citizen's rights is justified in the national defense. It also tells us that this situation may last indefinitely in a kind of "state of siege" condition. 1. It is open ended. On exactly the same basis, the often tyrannical governments of the Arab World have justified since 1947 the need to suspend "due process" and citizen's rights because "the nation" must be protected from the Zionist threat. I thought we were against this kind of thing. 2. The Jihadis are not an "existential threat" to the United States. A great many Americans were overcome by fear after 9/11. People in my profession(s) had assumed that everyone in America knew that the world was not a safe place and that America was not an exception to that really basic fact. It is clear now that we were wrong in thinking that. The events in New York City and the capital were catastrophic and tragic in the extreme, but they did not constitute an "existential threat" to the United States and the Jihadis still do not pose such a threat to the existence of the United States of America. What are they? They are a few thousand religious fanatics, backed by the money of a handful of really crazy rich people. They have been driven from their bases by our armed forces, harried across the world and continuously pursued by the security services of a great many countries. Our own security services have dealt severely with anyone within the USA who looked liked they were actually thinking of doing something violent. Presumably these fanatics have not abandoned their hope of inflicting grievous harm on the USA if they could manage it. It is worthwhile to consider the limits of their capabilities in the absolute worst cases. They could destroy a city. This is unlikely, but worth taking seriously because the consequences would be so grave. They could kill everyone on a train. They could attack everyone at a major event. These are the kinds of things they could do. None of those kinds of things constitute an "existential threat" to the United States. There would be a lot of dead people as a result of such attacks, but the country would survive. It would go on and on as a beacon of hope in the world, perhaps man's last, best hope. "Do you want to be safe, or do you want to be free?" This question is increasingly asked with some seriousness. The Jihadis are posited to us as an "existential threat" on an open ended basis. They are not, except as a justificatin for re-structuring American into a "security state." There are other "security states." None of them are really secure but they are very good at controlling their citizens. It is up to the courts, the Congress and the Sovereign People to decide if they are to be the descendants of those who stood against the King or just more "sheeple" to be herded about. Are we really going to accept that the instruments of government with which we fought the Nazis and Communists are going to be used to pick apart our lives? Are we really going to become someone's "subjects?" After thinking about the NSA domestic intercepts program, I have decided that much of the discussion of this subject misses the point about what has changed in communications surveillance in this country. Before 9/11 (with a few exceptions) domestic communications surveillance was a matter for the police (FBI et al) under the supervision of the courts. The police were required to provide the appropriate judge evidence which supported the need to inspect someones communication in preparation for a possible court proceeding against that person. The writs issued by such judges had expiration dates and the police were forced by the law to return to the courts periodically to obtain extensions. The police did not particularly like that because it was inconvenient to them, and the police (like everyone else) want to have their lives made as simple and safe as possible. A lot of them would also like to have the citizenry deprived of the right to own guns, a similar thing. Nevertheless, this whole system was part of our JUDICIAL system. The National Security Agency (NSA) is not part of the judicial system. It grew out of World War 2 codebreaking activities on the part of the armed forces (Enigma, etc.) and continued to grow like the Hydra throughout the Cold War. American government found large scale "exploitation" of Soviet electronic signals to be a comprehensible and worthwhile endeavor, something much more to American taste than the messy, more morally ambiguous business of espionage (HUMINT). It seems to me that all the talk of warrants and the FISA law is irrelevant. The decision to use NSA against US domestic communications had nothing to do with the courts or the FISA law. It was simply a decision to tell NSA to turn its antennae inward rather than outward. NSA is essentially a military organization although it employs many civilians. It is part of the Department of Defense (DoD). When given an order, it obeys with no quibbling about court orders, warrants, writs, expiration dates, justification. etc. This leaked to the press because people at NSA decided that their professional habit of silence was trumped by the implications of this massive a change in the privacy rights of Americans. "Al-Hurra" - Not So Free After All. "The same goes for TV stations -- including al-Hurra, the U.S.-sponsored satellite channel, which is supposed to be providing uncensored news from an American point of view. From the beginning, al-Hurra's operation in Egypt was subject to the covert control of the security services, a fact that is not always apparent to those who oversee the station from Washington. The services have close ties to some of the station's directors and handpick many correspondents. They even have final say over which guests appear on programs. As a result, anyone who has paid careful attention to the tone and opinions of the regular programming will notice that liberal, progressive, open-minded views are presented almost apologetically. While al-Hurra is supposed to be a vibrant, fresh forum for freedom, it has failed to provide a real space for balanced views, and so it has been incapable of competing with the "Islamic" al-Jazeera and "pan-Arabist" al-Arabiya channels." Hala Mustafa of the Al-Ahram center to the WASHPOST. "Al-Hurra" is not just "sponsored" by the United States. The network is the property of the United States government. Its studios in Fairfax County, Virginia are guarded by General Services Administration police. Its employees are US government employees or contractors to the US Government. How many hundreds of millions of dollars of American taxpayer's money have now been spent on "Al-Hurra" and "Sawa" radio which is its other "face?" The salaries and fees paid to the the largely immigrant staff of "Al-Hurra" are such as to make the network the object of Congressional investigation. One must ask how much the directors of these exercises in foreign "information operations" have known about the degree of Egyptian police and intelligence control of "Al-Hurra." The police control everything in Egypt on behalf of the presidency. There is no aspect of Egyptian life that is not subject to police inspection and control. Since our government now seems to think it is a good idea to make all aspects of our lives "open" to police and intelligence agency surveillance, perhaps it is not surprising that "we" have not exerted ourselves in this matter. Imagine what fools we look to the Egyptians with our prattling about freedom and democracy. Not to curdle the Christmas pudding or anything, but it's hard to see how Uncle Sam comes out a winner in any of the elections that have just taken place, however historically, in the Arab world. This isn't to contradict President Bush, who said, referring to Iraq's parliamentary elections, we're seeing "something new: constitutional democracy at the heart of the Middle East." Sure, campaign posters and ballot boxes are new. But the emerging nature of this constitutional democracy — from Iraq to Egypt to the Palestinian Authority — calls into question whether, as the president also said in referring to Iraq, "America has an ally of growing strength in the fight against terror." For that statement to be true, Arab voters would need to be electing brave anti-jihadists, right? They would be dunking their fingers in purple ink for reform-minded advocates of equality and freedom of conscience, not to mention peace with Israel. But with nearly two-thirds of the ballots counted in Iraq, the initial headlines tell a different story. "Parties Linked to Tehran Gain in Iraq," reported the New York Sun. "Secular candidates not doing well," reported the Los Angeles Times. Apparently, that's putting it mildly. So far, election returns indicate that the Shi'ite Muslim religious coalition, the United Iraqi Alliance (UIA), has overcome internal tensions and weak projections to win a dominating bloc of parliamentary seats. That means that the democratic enterprise in Iraq appears to have empowered proponents of sharia law with alarmingly close ties to the terror masters of Iran. Little wonder, then, that something approaching jubilation is the reaction in Tehran. "We share this victory with the Iraqi nation because we paid a price for its preparation, said Ali Akbar Hashemi Rafsanjani, the former president of Iran, making reference to the Iran-Iraq War (1980-1988). Usually described as Iran's "pragmatic conservative" in the Western media (not necessarily saying much), Mr. Rafsanjani continued: "It is a victory because the results were the opposite of what the Americans were seeking." "Akef, whose group won 88 of the Egyptian parliament's 454 seats in elections in November and December, made his comment in an attack on the United States' assertion that it is promoting democracy in the Middle East. He said the U.S. campaign was a cover for promoting its own interests and those of the Zionist movement in the region. Someone among my correspondents wrote recently to say, that I should relax, that "all such" extremist movements in the Middle East become political parties embedded in the body politic of their country over time and are rendered harmless, by being involved with "real" concerns. I suppose that the Egyptian Muslim Brothers (MB) would be a good example. Stimulated by the bloviations of academics who generally believe that the evil deeds of Western countries and the "oppression" of autocratic government are responsible for Islamic extremism, the US Government has been inspired to foster the political empowerment of the MB in Egypt. As a result the MB in Egypt grew its caucus in the Cairo parliament from 11 seats to 88 in the recent election. Feeling its "oats" it now speaks up in defense of a belief held by many in the Islamic World, namely that the Holocaust is an invention of Western propaganda designed as "cover" for yet more evil deeds by the USA under the guidance of "Zionism." Zionism is here used in quotes because it is not the Zionism of the Zionists to which they refer, but rather the "Zionism" of the "Protocols of the Wise Men of Zion" in which many of the same people fervently believe. For those who may not have heard of this interesting work of political fantasy, it is a document written in central Europe in the 19Th Century purporting to be the records of the planning conference at which the Jews laid out their plan to take over the world. Someone should ask Mr. Akef if he believes in that as well. 1- They intend to create Sharia law states in preparation for merger of these states into the Umma. Within those states they will tolerate nothing that is at odds with their view of Islam. 2- Antipathy to the West and particularly to the US as leader of the West is a "treasured" belief since they see all of mankind as locked in a struggle between the Muslims and "the other." Among Islamists such beliefs are so strong that any and all actions by "the other" are interpreted on the basis of learning what evil purpose "the other" had in them. "the leverage they now have with these terrorist groups" What leverage is that? Mahmoud Abbas is and always was incapable of "asserting his control" over Hamas, Palestinian Islamic Jihad (PIJ) and similar groups. These are groups that have always rejected the authority of the Palestinian National Authority (PNA) and they continue to do so. Israel destroyed the para-military forces of the PNA several years ago, fearing apparently that they would become a serious enemy in the event of Palestinian statehood. Abbas and his various PNA/Fatah predecessors have been a "wasting" element in Palestinian politics for some time as Israel has gradually demonstrated to the Palestinian people that they are not to be taken seriously. Was the PNA supposed to attack and subdue Hamas/PIJ with what is left of their security forces. What a joke! They could never do it. Never! what is more the Palestinians have no desire whatever to make life easier for the Israelis by fighting a civil war against each other. "Assert its control over..." Ridiculous. Which brilliant scholar at AEI or wherever sold that to Rice and company? We have a long history of self-defeating policy in the Middle East and one could view this folly as part of the American tradition of diplomatic foolishness in the region. Sadly, the Israelis, who live there and ought to know better, encourage this kind of silliness instead of having their friends in AIPAC put a brake on it. If the Israelis can not find a political solution with the Palestinians, they can always build their walls higher, but to further confuse the thinking of the US Congress is a big mistake. This will further increase the prospect of Hamas political victory. Abbas should postpone the election again and hope that people shut up over here. "But let's just say, in 10 years or a few years, a president is elected who doesn't want to do those things, but you've given him this kind of power. What happens then?" "Well," Cheney replied, "it will be up to him whether or not he uses it." Cheney's idea of the head of state invested with absolute power is a venerable one. Bush's presidency is the latest experiment to achieve it. Yoo's memos are the founding documents. But the idea lacks an American pedigree. I am depressed that so many analysts and spokemen for the media and government continue to treat the subject of the elections in Iraq as though what matters is the PROCESS rather than the OUTCOME. "BASH: You talked about the fact that you briefed Congress voluntarily, that you do have a review process. But let's just say, in ten years or a few years, a president is elected who doesn't want to do those things, but you've given him this kind of power. What happens then? CHENEY: Well, it will be up to him whether or not he us it. BASH: Does it concern you that somebody you met you wouldn't necessarily trust with that kind of power. CHENEY: The fact is the law is the law. The Constitution is there. It's been adhered to and followed in this case. And you know, when you go to war, when you're attacked on your homeland, when you lose 3,000 people in a couple of hours one morning, and you're faced with a possibility that same organization might try to attack the United States with even a deadlier weapon, perhaps nuclear weapon if they could get their hands on it, or a biological agent, you have to actively go after the terrorists. Now, after 9/11, the 9/11 Commission that criticized everybody in the government because you couldn't connect the dots. Now we're connecting the dots and they're still complaining. So seems to me you can't have it both ways. The fact of the matter is this is a good solid program. It has saved thousands of lives. We're doing exactly the right thing. We're doing it in accordance with the Constitution and the laws of the United States. And it ought to be supported. I remember that the VP's oath has to do with defending the constitution against all enemies "foreign and domestic." So, I guess the question should be: "Who is an enemy of the constitution?" Jerome asked about Bonsai. My classmate Stan Henning who lives in Oahu offers the following. Whatever I know about the ME, he know much better about the Far East. Also Strange rocks (guaishi). Located in the Wuhou Memorial to the famous Three Kingdoms strategist, Zhuge Liang, in Chengdu. Stan wishes you all a Happy New Year in the Year of the Dog. There are so many ugly things in the world lately that I thought to put this piece by Hiroshige up for everyone's pleasure. I received this from Diana Moon, if this is her name. I find it to be an interesting compilation. You can never be sure of the result of the "counting" in a Middle Eastern election until the "dust settles" but this is disturbing. "Iraqi bloggers react to the disaster. Whatever the differences among them, they are all appalled. They are reacting by screaming fraud. I have no way of knowing whether this is true, but they think it's true. -- ed.] won 451,782 while Allawi's list [Iraqi List, secular -- ed.] won 327,174", said a spokesman of the election commission. These results when final will grant the UIA many more seats that what was expected, something that obviously upset the Accord Front. Four leaders from the Front are holding a press conference right now in Baghdad and they strongly rejected the announced results. Tariq al-Hashimi and Adnan al-Dulaimi, the two leaders of the Front are asking the election commission to "reconsider these results or redo the election in Baghdad… we ask our supporters to remain calm now but if our demands are not met we will have to make a different decision" said al-Hashimi who also accused the UIA of putting pressure on the commission to "manipulate the results for the benefit of UIA… the UIA are playing with fire!". Al-Hashimi and al-Dulaimi, who looked really angry, spoke of many violations and incidents of fraud including the report we heard of some time ago about forged ballot papers coming from Iran and the cases in which boxes didn't reach some Sunni regions. The Front has also said that they will not approve the outcome of the results and will not recognize the parliament or the government if their objections are not considered or if the elections are not redone in Baghdad under international observation. "This election will not mean the end of violence. But it is the beginning of something new: constitutional democracy at the heart of the Middle East. And this vote -- 6,000 miles away, in a vital region of the world -- means that America has an ally of growing strength in the fight against terror." ...be remembered by historians in the same way as these words, from May 1, 2003? "Saleh Mutlaq, head of one of the two major Sunni lists, said he was resigned to the fact that the Sunnis would win far fewer seats than they wanted. Mutlaq accused the United Iraqi Alliance of sending Shiite militiamen to the polls to hover over voters and said imams at many Shiite mosques told the faithful "they would go to hell if they didn't vote for the UIA." "I want to send a message to the [Bush] administration that this election is going to lead to disaster in Iraq," said Mutlaq, who added that he would boycott the parliament unless Sunnis or secular Shiites were awarded some of the most important ministries, such as interior and defense. "I want the Americans to review this election and cancel it." Am I being sarcastic in the titling here? Yesterday, I wrote that I hoped a formula had been found to foster a political coalition among the non-clerical factions in Iraq. If there was such a plan, it has failed miserably. Federal authorities reported the arrest in Queens of , described as a leading assassin, and said they stopped a plot to kill a "very important target," possibly a world leader attending the U.N. General Assembly meeting. Robert Bryden, chief of the Drug Enforcement Administration's New York office, said Munoz-Mosquera, 24, was "the single most trusted assassin" for Colombia's Medellin cocaine cartel. He said officials did not know Munoz-Mosquera's target. Munoz-Mosquera is suspected of killing 40 Colombian police officers, setting 12 car bombs and masterminding the murder of a Colombian presidential candidate in 1989, authorities said. DEA agents staked out a pay telephone in Queens Wednesday night, according to court papers. A man later identified as Munoz-Mosquera got out of a car, made a phone call and was arrested, authorities said. "We have a lot of eyes and ears in New York in the Colombian community," Bryden said. Now for the real story. Mosquera was grabbed thanks to a roving wiretap. I've heard the story from friends who were involved with the operation. DEA officials learned that Mosquera's mom was going to call him. They moved quickly to set up a roving wiretap. They knew he was in New York but did not know where. Mosquera took many precautions, including having the in bound call bounce around the United States. He sent a third party to answer the phone. When he left his vehicle, DEA agents closed in and put a major league killer in jail. He was later convicted and is serving a long sentence in a high security US penal facility. The FISA authorization was obtained subsequently. So, President Bush is wrong. You don't have to break a law to get quick action. Not only can you catch terrorists using FISA, we have caught terrorists. The real story behind the unauthorized wiretaps authorized by President Bush probably concerns the source of the info. It appears the most likely explanation is that the Bush Administration did not want to have to tell a Federal judge that they were using information obtained from interrogations that violated the spirit and the letter of the Geneva Conventions. Instead of protecting the nation the President is covering his derrier." "The women admitted working on Saddam's biological and germ warfare projects but said such weapons were destroyed long before the U.S. invasion. Baghdad lawyer Badia Aref said Taha and Ammash were among 26 senior detainees in the process of being released. U.S. military spokesman Lieutenant Colonel Barry Johnson said eight "high-value detainees" had been freed on Saturday, and were among 27 senior prisoners judged to be eligible for release. I smell a deal, folks. The US has now decided that it can not afford to see a long term political victory and control of the Iraqi government by the Shia religious parties (SCIRI, Dawa, Sadrists). What is the solution for us? It is to try to promote a coalition between the secular nationalists under Ayad Allawi and the non Jihadi insurgents and their Baathi and "rejectionist" supporters in the political world (read Sinn Fein here). This discussion has been ongoing and I would bet anyone lunch at the watering hole of their choice that the other side has asked for a "gesture of good faith." My congratulations to whomever is working on this. A coalition of these people under Allawi might keep Iraq out of Iran's orbit. Will the Shia religious parties accept such an outcome? Probably not, but this is important and it might as well be "sorted out" now. George W. Bush may have been a mediocre student in college, but he clearly mastered Orwell's works, especially 1984 and Animal Farm. How else to explain his reliance on repeating catch phrases that are misleading and, at times, outright false, while trying to shape and mold American public opinion to support his policies? Previously Bush juxtaposed the phrase "9-11" with Saddam and convinced a majority of Americans that Hussein was somehow involved in the attacks that destroyed the World Trade Center towers. Even though there was no truth to the charge, the President, even to this day, continues to use the 9-11 attack to justify the war in Iraq. NSA - Spying on Americans? Rick Francona is an old friend and colleague. He is an expert SIGINTer. He has something to say. "A December 16 New York Times article, "Bush Lets U.S. Spy on Callers Without Courts" has caused an uproar around the country. Perhaps some background is in order. The National Security Agency (NSA) is the largest agency in the U.S. intelligence community. Although nominally part of the Department of Defense, its operations are closely supervised by the Director of National Intelligence and support the entire executive branch. From its headquarters at Fort Meade, Maryland, it oversees a worldwide network of intercept stations operated by "the Fort" (as it is known in the business) and the military services, using the latest technologies to access communications of all types. You name it - telephone, radio, fax, email - NSA intercepts it. NSA's primary focus is on the collection of foreign communications in response to intelligence requirements, be they for military commanders deployed to combat zones, diplomats negotiating on behalf of the United States, etc. Generally, the communications intercepted by NSA take place outside the United States. And generally, NSA is prohibited from the intercept of communications between "U.S. persons, entities, corporations or organizations." I have been careful not to say that anyone ever lied about any of this Iraq business in the Bush Administration or nearby in the "Bushes" (as the Rev would say). I have done so becasue I do not KNOW that they did, and because I think that a massively delusive disconnect fom reality is the more likely explanation for their statements. Politically, some of these statements are interesting, as are the boringly easy way that they are "taken up" by the press and repeated over and over ad nauseam. Perhaps you remember the "mantra" before the January election. "Iraq's first ever democratic election." was the "drift." Interesting statement this, because Iraqis voted in parliamentary elections for the Ottoman Parliament in Istanbul when they were part of the empire and then voted for 35 years more or less for parliamentary representatives under the Hashemite Constitution from the twenties to the late fifties. the press finally "tumbled" to the truth in this matter and began saying that it was the first democratic election "in 35 years," but it took a while. Was all this a deliberate falsehood? I don't know and so will not say so, besides, as I said before, self delusion and group-think are satisfactory explanations. Now we have adiminstration spokespersons like Dr. Rice making peripatetic appearances on the Sunday Newsies to tell us that the government produced by these last elections will be the only constitutional and democratic government in the Arab and Islamic Worlds. If that is so, then why were we so thrilled with the prospects of elections in Iran a while back? Why did Rice and K. Hughes spend so much time in Egypt seeking to influence the process there in the recent election? If the process was seen to be utterly corrupt and without merit as an exercise in Democracy then why did we lend credence to it by participating in the grand "dog and pony show" which preceded the election. What's the deal? It seems that we only complain of election processes when the results are not what "we" want. We claim to have friends among the govenments and politicians of the Middle East. We went to a lot of trouble to advance the cause advocated by Saad Hariri in Lebanon in their last parliamentary election. We also seem to be fairly happy with the result. Do we not believe that the election was constitutional and democratic and that the government that resulted was legitimate. If we do not, then we are sponsors of an undemocratic government. What about Jordan. King Abdullah's little country has a parliament. It has two houses and at times in the past members have been elected who did not please the king in their politics. When will we begin to harass the Hashemite Kingdom with acusations of tyranny and illegitimacy? Never, I hope. "Something Wicked This Way Comes?" Stephen King, in his apocalyptic novel "The Stand" makes repeated references to the "Beast" coming slowly out of the west. We are in the presence of another "beast" this one coming out of the East. The "beast" is Islamist government and it is approaching assumption of power assisted by the misguided policies and judgments of the Bush Administration. Islamist movements, political parties and enthusiasts all have two things in common. One is a determination to install the nightmare of medieval and anti-humanist Sharia law government wherever they can, and the other is un-remitting hostility to the United States as the leader of what the Islamists see as the anti-Islamic and heathen West. Any person knowledgeable of the nature of such movements knows that this is true. Muslims know that it is true. The Bush Administration does not seem to grasp this simple truth. Instead, the Bush people assure us that the principle problem in the Islamic World is a lack of constitutional democracy and that fair elections and the rule of law will bring forth the "better angels" of peoples' natures and that having been released from the grasp of dictatorial republican or monarchical rule, the Muslim peoples wil become Western in attitude and abjure support for Islamist Jihadis who wish to attack the United States. Presumably these "evolved" and "new" Muslims would also no longer desire to eliminate Israel as a factor in the world. The conjunction of the Bush view of this and the Israeli view is not a coincidence. The expulsion by U.S. military officials of two embedded journalists in Kuwait, reportedly for photographing a shot-up military vehicle, has prompted outrage from Military Reporters and Editors (MRE), which is calling for a change in embed rules that apparently led to the action. Sig Christenson, MRE president and a military writer with the San Antonio Express-News, said no rule barring photographs of damaged vehicles existed when he first embedded in 2003. He said the alleged rule is one of several that have been added to the embedding program since it first began nearly three years ago, and should be changed. 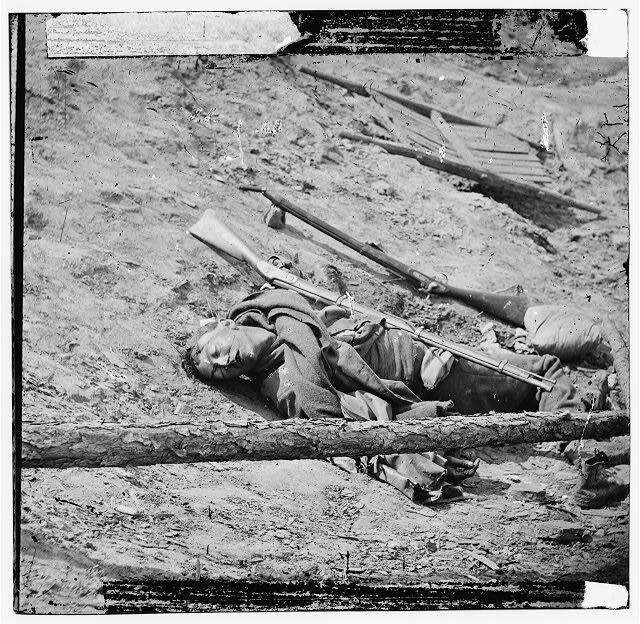 Matthew Brady took this picture of a dead man in the trenches at Petersburg, Virginia in 1865. “Months after the Sept. 11 attacks, President Bush secretly authorized the National Security Agency to eavesdrop on Americans and others inside the United States to search for evidence of terrorist activity without the court-approved warrants ordinarily required for domestic spying, according to government officials. This may have been a criminal act on the part of the president. The law which created the National Security Agency is pretty clear. NSA is about listening in on FOREIGN communications, not US domestic communications. There is an exception in the law that would allow NSA to be used for this purpose in exceptional circumstances and with the issuance of a writ by the Foreign Intelligence Surveillance Court (FISA). Information so far does not indicate that this procedure was followed. Congress is not happy. This probably played some role in defeat of the re-authorization of the Patriot Act. It appears that Mr. John Yoo took the position while in government that in wartime the president of the USA could do whatever he liked. “After the September 11, 2001, attacks, President George W. Bush authorized the National Security Agency to eavesdrop on people inside the United States without the court approval usually required for domestic spying, The New York Times reported on Thursday. For several years after the presidential order was signed in 2002, the super-secret intelligence agency monitored the international telephone calls and e-mails of hundreds of people inside the country to search for evidence of terrorist activity, the Times said in an article on its Web site. “On Foreign Soil.” The National Security Agency (NSA) is the biggest, richest potentially most invasive of all the parts of the US intelligence community. Its electronic “reach” extends across the world and deep into outer space. If you communicate through electronic means, your messages, telephone calls, etc. are all potentially at the “disposal” of NSA. It was not the intention of Congress that this mighty power should be exercised against citizens of the United States on American soil. Consequently, the law governing the operations of NSA and the governing rules and culture of the agency has prevented such abuses for many years. The functionaries of NSA like everyone else in the intelligence community are American citizens and they, like the great majority of Americans, value our freedom as human beings before almost everything else. It is not surprising to me that some of them have”blown the whistle” on this abuse of NSA’s power, an abuse directed at the American people. When the government of the US is under traditional leadership, eavesdropping on American citizens is a matter governed by law and residing in the Department of Justice. The federal police (FBI) are the people who do such a thing after having obtained a court order and as part of a criminal investigation. In this case an agency of the national intelligence agency dedicated to the defense of the state against foreign enemies has been used to violate the privacy of the very citizens whose representatives created it for their protection. What are we, cattle? Are we here to herded about and safeguarded by wise and superior beings who function on a plane of existence where the rules we made for our own governance no longer apply to them? This beautiful Christmas card comes courtesy of Ashland University. Merry Christmas to all. Ground combat is not like sensitivity training where the idea is to insure that everyone's self image is preserved in an atmosphere of "consideration for others." No, engagements in ground combat are supposed to be conducted in such a way that you and your comrades survive and the other side does not. This is definitely a "zero-sum game." 2-Maneuver takes place. In other words while one group does the cowboys and Indians thing of "Cover Me," the other group "goes for" the enemy on the ground, hopefully not frontally. That's how things work. Fire and Maneuver. Every soldier with any real knowledge knows that's how it works. It doesn't matter if the force engaged is a Rifle Squad (11 men) or an Army Corps (many, many men). That's how it works. If you try to do it some other way, for example, not have enough available fire support to "shut the enemy down," then the enemy is going to be free to shoot the hell out of you and you can expect to loose a lot more people while trying to maneuver if you can maneuver at all. Why am I going on about this? It is because I have finally grasped the fact that US ground troops in Iraq do not have anything like the fire support available to them that people of my "primitive" and backward generation were used to having. Here is how things worked when I was young and spry. There would be a "meeting engagement." (troops meeting) The friendly commander would immediately request fire support from supporting artillery through his Forward Observer or an Air Force liaison officer. The first "ranging" fire from the artillery would arrive quite quickly. The fall of the shot would be adjusted with a round or two more and then "fire for effect" would be requested followed by a lot of shells falling all over the target area, maybe with some smoke thrown in for good measure. While that was going on the enemy would stop shooting, and our side would get up and "go for them." All of this would take place at a really low level of coordination with no seniors involved at all. This was routine AND the way to stay alive. Apparently this is not the case in Iraq where "fire missions" seem to be approved at division level, far, far above the level of the action. From everything I can learn there is already a shortage of tube artillery in Iraq and as a result troops are often outside the "range fan" of friendly guns, a situation I was never comfortable with. Airplanes are nice but not all that reliable as to timing when you need them. They also often have a bad tendency to mistakenly drop their ordnance where it is not required. To compound this problem, a desire to win "hearts and minds" and not to anger people by killing their relatives has made it a major issue as to whether troops engaged in a built up area should be given fire support that might (probably) would kill civilians. After all, the best text books on how to do counterinsurgency tell you that you can't upset the civilians. Sounds good. As you think this over, I will give you my opinion that to be honest (intellectually honest) you have to accept the fact that by not making as much fire support available as is needed up front (as opposed to in the rear at Hq.) you are making a decision to have more Americans killed and wounded. Its a trade off. Some Arab gentlemen with whom I was lunching today politely listened to this rant, and observed correctly that "no one in the Arab World would believe that we are holding back like this," especially at the expense of our people. They are right. No one in the Arab World would believe that, but it seems to be true. If it is not, let me know. I would estimate that our casualties in killed and wounded would have been lower if it were not for this. Of course Iraqi casualties would have been higher. Saddam Hussein's trial will go down in history as a masterpiece of mis-judgment which played directly into the hands of the enemies of the West. His crimes and brutalities are manifest. He ruled Iraq with a ferocity of method and maniacal cruelty that would justify his execution many times over, but the method and publicity surrounding his trial will make him what he wants to be, a hero for the ages to many, many in the Islamic World. He wants to be remembered not as a persecutor of Iraqi Shia and Kurds but rather as a modern Saladin ( Yusuf Salah al-Din al-Ayyoubi, etc.). He is positioning himself to be remembered as the man who "stood up to" the Christian imperialists and Zionists of various persuasions. His antics in the court room are intended to establish an argument for the illiegitimacy of the court, the injustice of its actions and the continued existence of the previous government. He believes himself to be president of Iraq. His government never surrendered. He never resigned. No major units of his army surrendered. They dispersed but did not surrender. He believes that as the decades pass the memory of his misdeeds will fade and that the trial, and his behavior as a defiant example of the kind of "manhood" widely admired in the Arab World will persist and grow into a legend, a legend of the trial and execution of a legitimate Arab head of state by the "occupiers" and their "lackies." Are we contributing to this? Yes, we are. This trial, conductd on television, may meet Iraqi standards of probity, but it will not stand up under long term examination in the court of history. The trial is being conducted largely on the basis of testimony by witnesses who thus far have not connected him directly to the massacre in the village concerned. These witnesses are not available for cross-examination except on the basis of questions submitted to the judge who can decide whether or not to allow them, and in some cases they are hidden behind a screen and their voices are disguised. What happened to a right we Americans hold sacred, the right to confront one's accuser? People in the Arab World are not stupid. A lot of them want Saddam dead, but they know a shoddy proceeding when they see one. To add to the drama, someone is killing and attacking members of the defence team. These lawyers are threatening a "walk-out" based on a claim of fear for their lives. The way things are in Iraq, we may see physical attacks on all concerned. Why are we doing this? We have enemies incarcerated all over the world without trial. This man's trial, as it is being conducted, is a major long-term victory for our enemies. Thirty years from now kids will be buying "Saddam T-shirts" in the suqs of the arab World. Shot in the foot again. The Right Idea Too late? Michael Ware of Time magazine told Christopher Matthews this evening that after next week's election in Iraq the US policy will be to force the inevitable government of Shia clients of Iran to accept Sunni nationalists into the government in positions and numbers that will insure a "peace-making" acceptance of that government by the people the president described as "rejectionists" at Annapolis a few days ago. Perhaps Ware did not say "force" but that was the idea. Ware says that US military intelligence assures him that the American government has now accepted the idea that the Baath Party must be revived (without Saddam's clique) because it represents the nationalist interests of the Sunni Arabs and many among the secular Shia Arabs. The neocon "agitprop" machine sold the American people the notion that the Baath Part was the reincarnation of the Nazi Party. In fact, the Baath exists all over the Arab World as a unifying force that spans religious differences, espouses modernism, and promotes the rights of women against traditionalism. Where did the image of the Baath as Nazi Germany reborn come from? Go ask the high neocons and their image maker operators. Go ask them. Don't bother to talk to the fraudulent "little people" like Paul Vallely (See blog No Quarter). This is the policy that we should have had from the beginning. I hope that it is not too late. The process of Shia political consolidation is now far advanced, and it may be that developments in Iraq are now beyond our ability to determine or significantly affect the end game. Why did we go down the "suicidal" road of seeking to bring our long term enemies to power as a satellite government of Iran? Simple. Read the works of Reuel Gerecht and his friends at AEI and the Weekly Standard. The neocon Jacobin crowd believed and still believe that Sunni Muslims are the "root of evil" in the Middle East and that the grip on power that they have maintained for centuries everywhere in the region but Iran must be broken to insure a transition to "democracy." Rubbish. "Democracy" used as code by these people means a forcible transition to a secular, Western way of life antithetical to everything in the majority tradition of the Islamic peoples. This is beyond our strength unless we are to accept the administration's exhortation to a "generational" mission to do so. Howard Fineman earlier told Matthews that it is the intention of the administration to begin to withdraw from Iraq after the election next week. Everything I hear from the military indicates to me that this is so. We will attempt a withdrawal from many areas in the contested Sunni Zone. What remains to be seen is whether or not the "Iraqi" forces will then face an empowered, stronger guerrillas movement operating in bigger units. If this is so, then we will have a test as to whether or not these "Iraqi" forces,which have not fought very well thus far and which are lightly equipped, can hold towns "vacated" (by us) against the rebels. Oops! (rejectionists). I suspect that they can not without considerable US support. a- The Shia government is going to ask us to leave. (quite possible) He also said that if that happens, he thinks that the ultimate arbiters of the situation as it develops will be the government of Iran with its armed forces as a possible determinant. Baer said that he had been in Tehran this year and that the "Mullahs" spoke openly of their intention to intervene if necessary to protect Shia rule in Iraq. b- Bob also gave his opinion that the Iraqi Shia would prevail in a struggle against the Sunni Arabs on the Sunni Arabs' own ground. I think he is mistaken. A Shia triumph in the Sunni Zone would require the intervention of the Iranians. Numbers only count "so much" against nationalist fervor, popular support and a lot of prior military experience and skill. How much can we influence the future in Iraq? Some, but less every day. "...With the mini-Tet raging, more than 50 rebels lobbed mortars and fired rocket-propelled grenades at the U.S. bases before they closed in under cover of machine-gun fire from virtually 360Â°. By the end, about the time Murtha wrapped up his press conference in Washington, coalition forces had stormed past dead insurgents to retake Ramadi's central mosque. But this is still a city the insurgents can claim they own. Although a U.S. Army brigade hunts them daily, the rebels move freely among a supportive populace. U.S. troops are despised here. The insurgents are embraced. "They are the people we see every day who give us a loaf of bread on a patrol, the people we will be fighting that night," says Lieut. Colonel Robert Roggeman, whose 2-69 Armored Regiment is battling to control the eastern part of this city of 400,000. I am not sure what the "blue platoon" is exactly. The battalion (2-69 Armor or 2nd Battalion, 69th Armored Regiment) is a tank battalion. "Blue Platoon" would indicate an infantry unit. Perhaps this is an infantry element "grown" specfically for the necessities of the Iraq urban operations environment or it could be part of the battalion's reconniassance troops. The essence of US military strategy in Iraq lies in the creation of "Iraqi" troop units who can consolidate central government control over the entire country. "Clear and Hold" is the order of the day-week-month. We clear and they hold (the towns). What we see in this story by Michael Ware is that 2-69 Armor is unable to fully "clear" Ramadi of insurgent forces. It says that 2-69 Armor works its sector hard, reduces the level of activity of the insurgents, and then sees the insurgent forces re-bound and re-constitute themselves out of a sympathetic population. It says that the insurgents can mount serious attacks involving cordination of fire and maneuver, and this in a town that has been receiving serious attention from US forces for a couple of years. This is a not a good omen. What will have to be seen is whether or not the insurgents try and/or succeed in taking these towns away from the government when US forces are withdrawn. Someone wrote to me today to inform of the ongoing debate in Washington's "circles of exalted brooding" with regard to the "discovery" on the part of defense academics and administration allies of the now hoary doctrine of counterinsurgency worked out largely by French soldiers in Indochina and Algeria at the cost of much suffering on the part of the insurgents, the native peoples and the French army itself. This was my response. “In many ways, Indochina was an unusual war of independence in that there were really several wars underway simultaneously, all linked but identifiable as different. 1-The Agitprop political program for control of the populace. This was waged with great effectiveness first against the French, then against the SVN government and us. This effort aimed to create a population hostile to anything but communist rule in South Viet Nam. To defeat the North Vietnamese campaign to annex the south it was necessary to counter this campaign of propaganda and action. 3- Viet Minh and later NVA regular forces out in the bush. 4-The political war waged against the will of the metropole. This war depended heavily on the cooperation of Marxist and crypto-Marxist groups around the world. A prime example would be the “New Left” movement of the ‘60s. What do we have in Iraq? There will never be an equivalent of the North Vietnamese Army. This force was largely “built” in China after the defeat of the Kuomintang. There is no sanctuary in which to build such an insurgent army for Iraq and the terrain does not lend itself to creating the ability to survive the experience of US air power. The closest thing imaginable would be an Iranian trained and equiped Shia army in some future in which the Shia find it necessary to assert themselves to that extent. The agitprop process is doing well even if the “product” being sold is now salvation rather than a Marxist and independent earthly paradise. Guerrilla units are growing steadily in number and sphere of their activity. This is in response to the effective agitprop work being done to construct a parallel “state.” I would anticipate that US withdrawal from remote areas will see the growth of guerrilla combat units in those areas and effective pseudo government control of these by the enemy. There is no effective political war being waged here in the US by the enemy. The noise on the Left of the blogosphere means little in forming American public opinion. What counts is progress in pacification in Iraq. There has been none and that is what is cutting into public support as reflected in Mr. Murtha’s admirable if confused statements. Most of what is being said about counterinsurgency and Vietnam is silly. The US Army had a highly developed doctrine of counterinsurgency well before our entry into Vietnam. This had been called into being by the emphasis placed on it by the Kennedy Administration and was based on the same French models that are now cited as “revelations" by the newly reoriented “Revolution in Military Thinking" crowd who previously were enamored of “Shock and Awe.” I participated in several Counterinsurgency (COIN) efforts in South and Central America in the 8th SFGA employing what was essentially the same French doctrine that Krepinevitch et al have “discovered.” These efforts were uniformly successful. Early on in the VN war (ours) several attempts were made to apply this doctrine in various ways. Special Forces/Civilian Irregular Defense Group troops, the Strategic Hamlets program, Ranger counter guerrilla units, etc. These did so well that North Viet Nam decided to intervene with its very fine army. In response to the prospect of having our advisors, their projects and our support structure wiped out by regimental and divisional forces introduced from the North, the US decided to introduce its own main forces and the main focus of the media then, and now the militaro-academic world became focused on the “force on force” struggle out in the woods. People do not seem to realize that while that was happening, the other nation-building” programs continued at “full bore.” It was not a choice of one or the other and only seemed that way to people in the 1st Cav. Division or some similar formation who had no knowledge of anything going on outside their base camps and night defense perimeters. In late 1967 and in 1968 USMACV changed its strategy to return to the concept of the primacy of the COIN approach and from then on the large maneuver forces of the command were primarily devoted to the task of keeping the NVA and guerrillas from killing all the teams and projects create under CORDS (in which I worked in Phuoc Long and Binh Long Provinces in 1968-69) This was a major struggle that involved hard, dangerous work in exposed positions and towns for a lot of people. It also involved the necessity for the major forces of the US to fight and neutralize the VC/NVA forces before they succeeded in destroying the COIN effort. This was a successful effort. Nixon’s policy decision with regard to withdrawal had little to do with the progress of this effort. What ended the war in victory for the communists was the abandonment of the South Vietnamese by the Congress after the NVA showed its teeth in the capture of Phuoc Bin in 1975." There are Public Information Officers (PIOs) and then there are propagandists. The two are not the same. - White. This is propaganda which is clearly identified as to source. The Voice of America, Sawa Radio, Al-Hurra TV. These are White propaganda outlets. Harmless, if often inept. - Grey. Propaganda not clearly identified as to source. A wire service, TV station or publishing house which does not identify its ownership. - Black. Propaganda which seeks to deceive as to source, In "normal" (non-wartime) times this is by law the domain of the CIA. In wartime it is equally the realm of the military (to the chagrin of the CIA). Propaganda directed against foreign audiences has not been thought "out of bounds" in the USA since the end of WW2. It is a fundamental principal of such action under American law that it should not be directed at the American electorate. We must ask if this principle has been adhered to, not by the CIA, but rather by political enthusiasts and "cultists" within the "information operations" and "psychological warfare" area of military activities. Beginning with the trauma that followed our defeat in Vietnam, there arose in the US Army a "movement" which sought an answer for the question of why our long and painful struggle had led to nothing but masses of refugees seeking refuge from the prospect of communist government. Various strange studies were funded for several years seeking answers which would not be too personally painful. Telepathy, telekinesis, firewalking, spoonbending, distant viewing, political warfare and propaganda against both hostile and friendly targets were all studied and experimented in by men who under normal circumstances were more stable and certainly less imaginative. (See the interesting work, "The Men Who Stare at Goats") In the end the Army rejected all this and returned to its usual preoccupation, but the tendency survived in the persons of several officers who have risen to high rank. Some have been high officials in the counter-terrorism and homeland defense fields. Some are now major media figures and others officials of the Department of Defense, but outside the "mainstream" of the Army. None are in the intelligence business. As a result of the continued existence of this"tendency," the Bush Administration has been influenced in the direction of manipulation of public opinion here and abroad as an instrument of warfare. We are now beginning to witness the results of such foolishness.